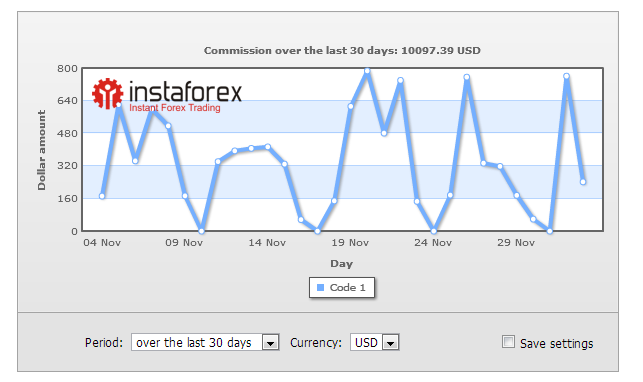 The paramount goal of statistics is to provide InstaForex partners with information about the highest-performance and the most profitable online marketing trend in the ratio of expired costs and received profit as an agent commission. 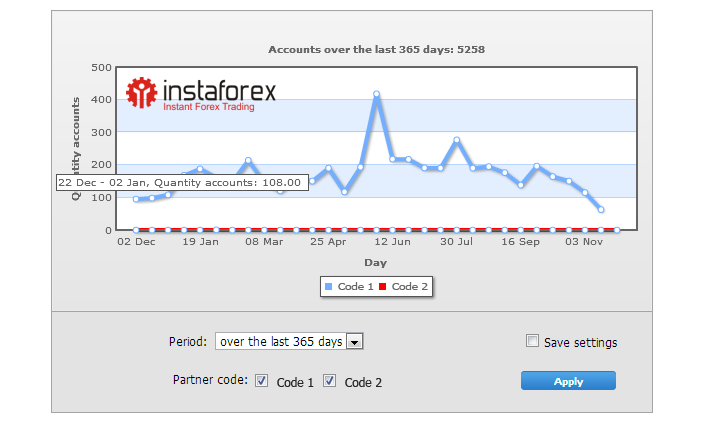 You can set any period: either chose one of the default ones, or key in exactly the one you need. 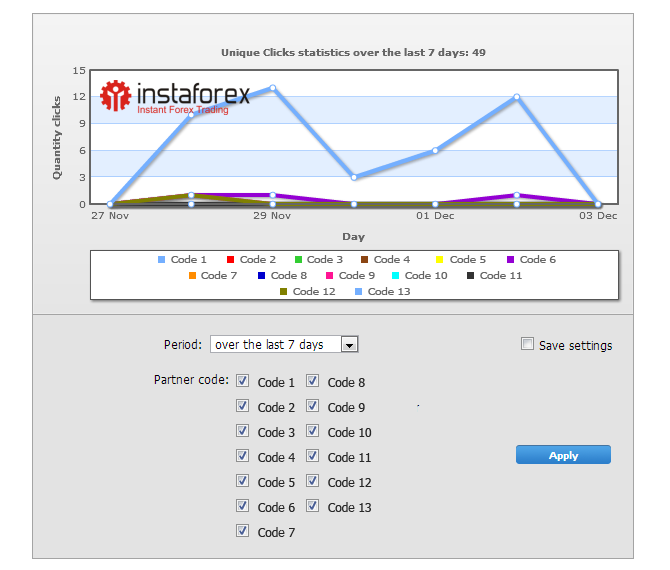 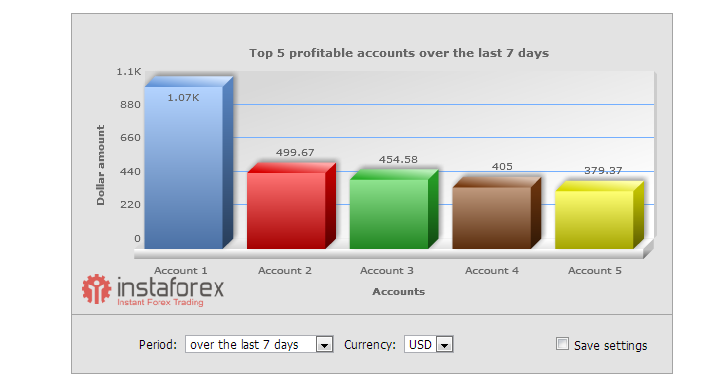 Statistics by customer is available in certain currencies (USD, EUR). 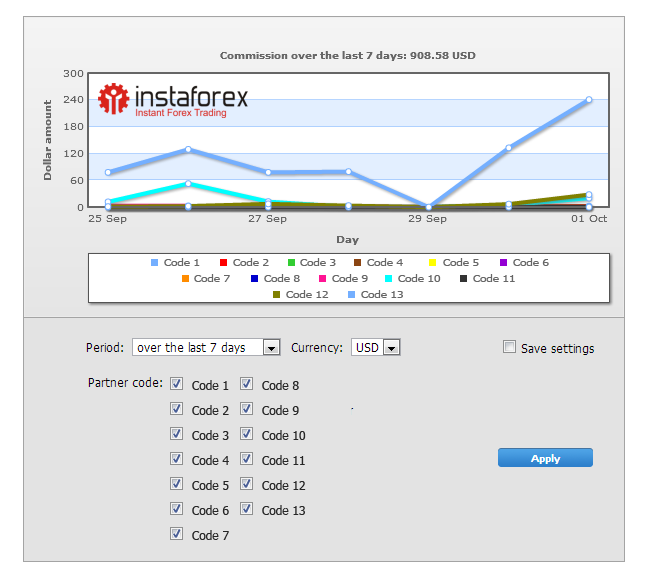 You can either see the total commissions you have got from your referrals within a certain period of time, or you can pick a certain affiliate code and see the total commissions from the referrals who registered via this particular code. 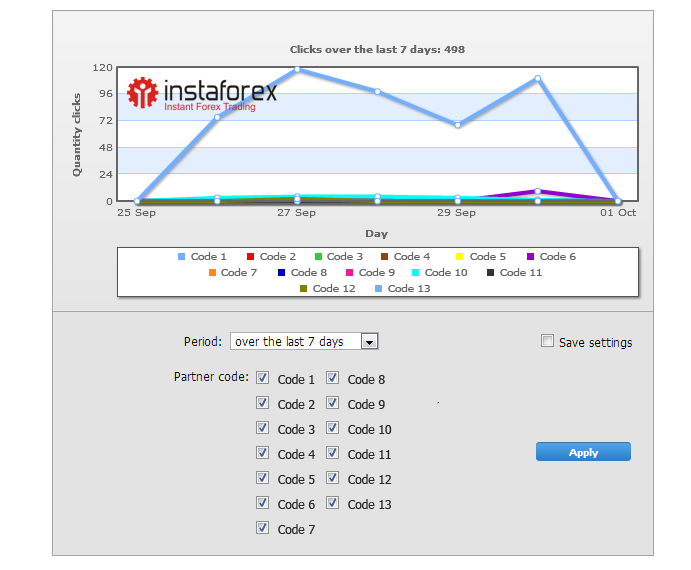 For your convenience, each affiliate code has its colour, which facilitates the information handling. 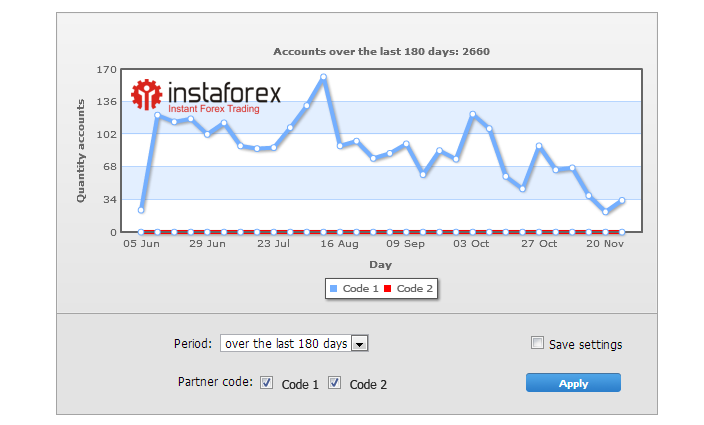 This section shows all the accounts opened within your affiliate group over a certain period of time. 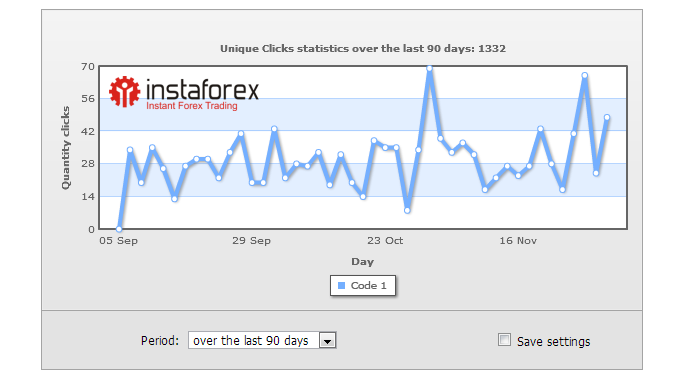 You can trace the general statistics on the registered accounts, pinpoint the fruitful months, mark a slump in the referring activity, or find the reasons to search for a new, more efficient marketing strategy. 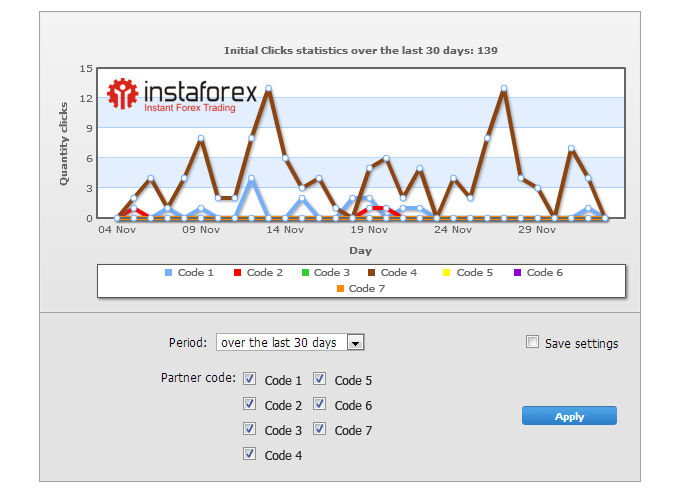 The statistics can also be broken on the basis of the custom affiliate code for you to figure out which marketing strategy has yielded the best results and brought you the most of referrals. 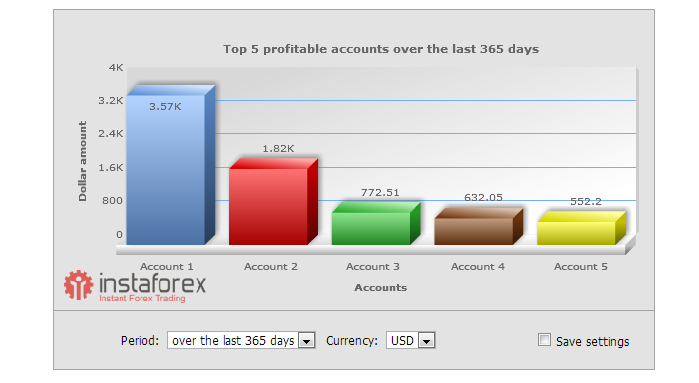 Discover the five leading, most profitable accounts in your affiliate group. 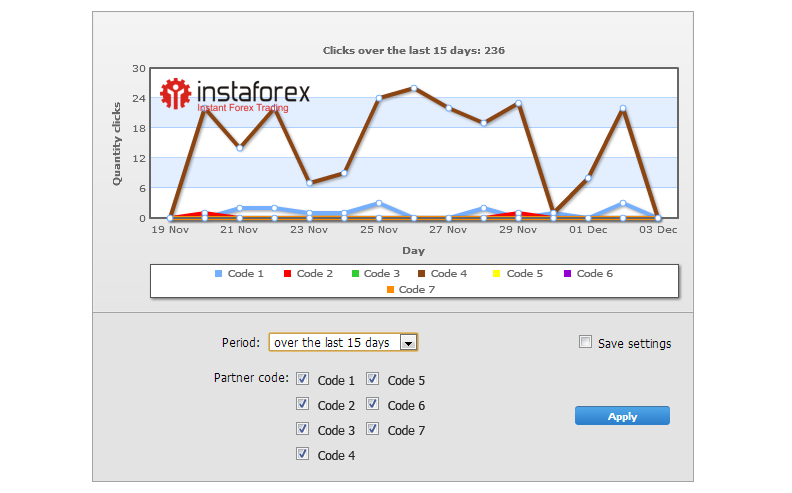 Such data may turn out to be useful when holding contests and competitions among your customers. 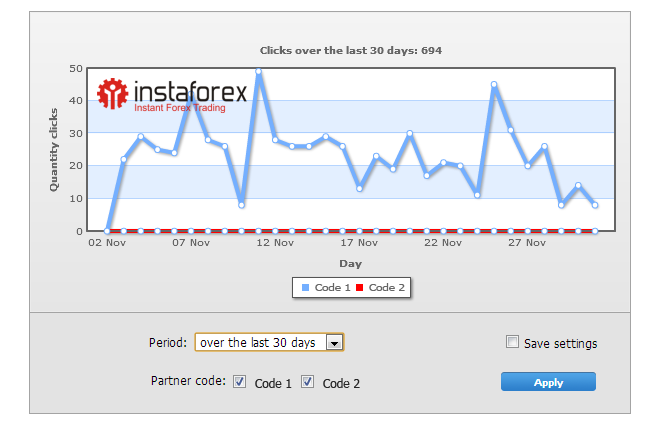 Choose the preferred time period to monitor the activity of your clients. 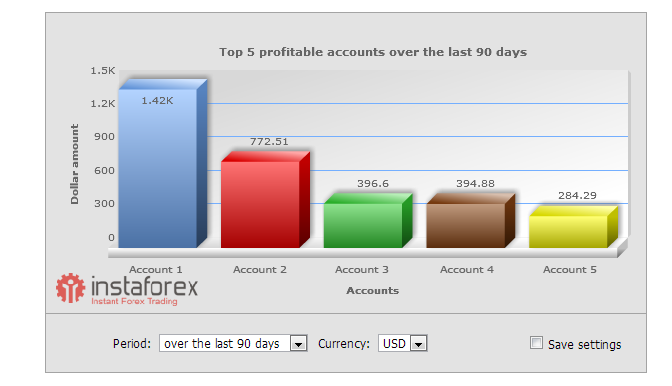 The rating of web resources used for account opening is at your convenience. 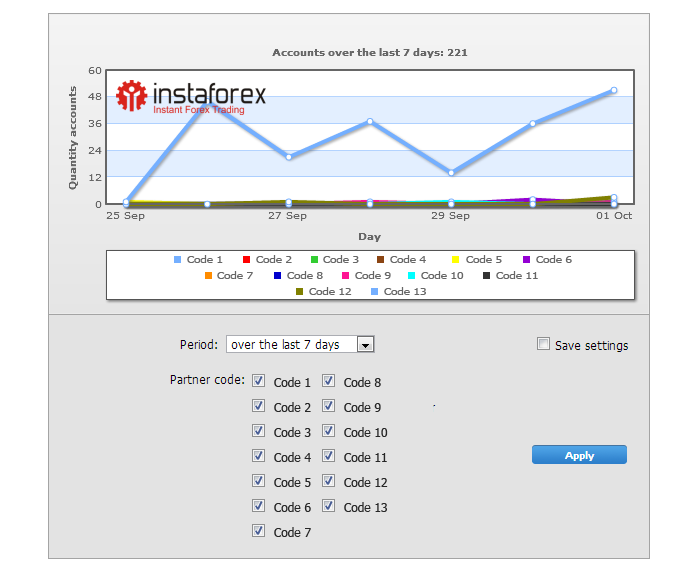 It is based on the links with all the custom affiliate codes ever used to open accounts in your affiliate group. 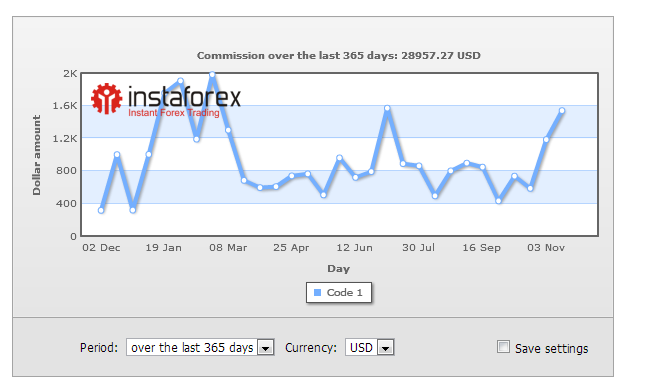 Thus, you can anytime look which resource is the most effective in promoting the affiliate link and hence find the best options for advertising. 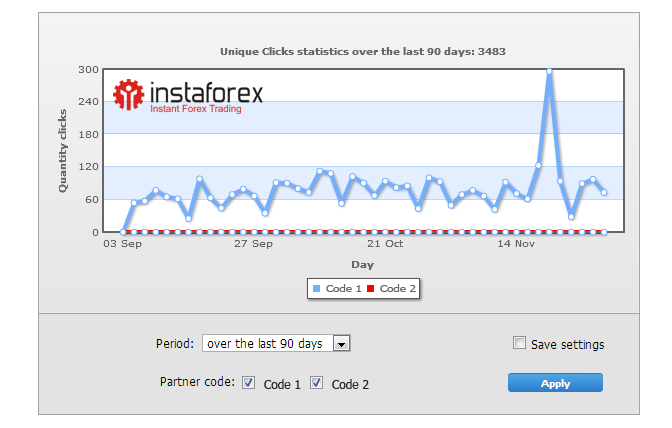 The chart shows the total number of clicks referrals gave to your affiliate link. 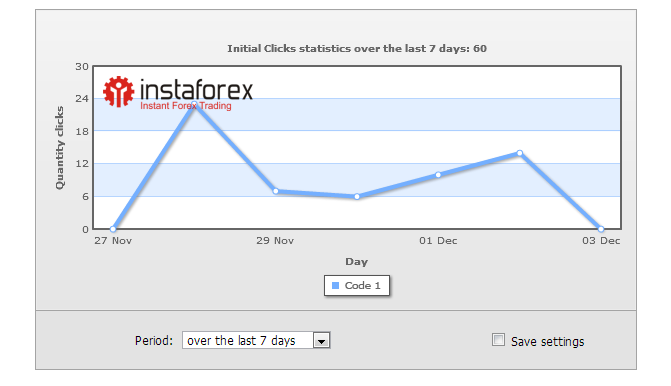 The chart represents the number of those who clicked your affiliate link for the first time. 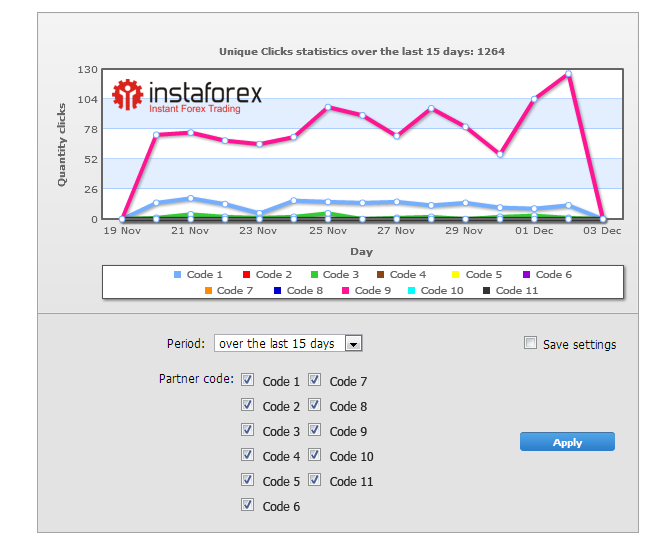 The Unique Clicks chart shows the number of users who followed your affiliate link for the first time from the given IP address over the past 24 hours. 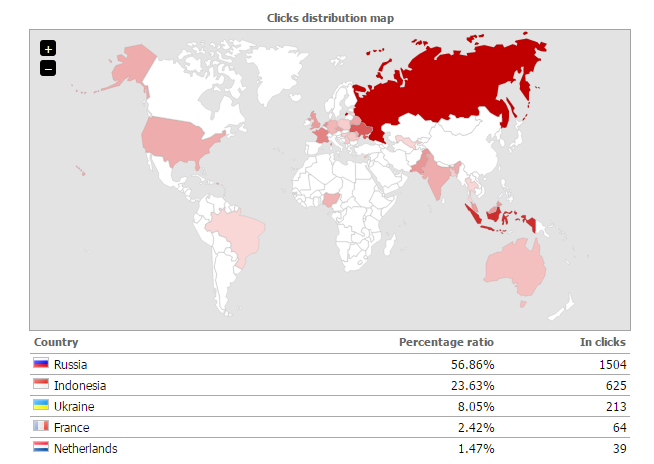 Clicks distribution statistics show countries with the highest rates of the affiliate link traffic.